Are you saying 277 is not a problem now? He said its a physical and mental barrier which it is, that has nothing to do with becoming a world class city. This will provide a return in $$, land value, livability, connections, park space, etc, etc, etc. I have always said that I-277 is/was a mistake. However I am not convinced this is the only solution to the issue even though it is being presented as such. i.e. This is the only way to solve downtown's issues so it must eventually be funded and built. No this isn't true at all, but it is the reason that we end up with so much stuff of this nature in Charlotte, why we even have the road int the first place, that never achieves this goal. These plans smell just like the very common "solution looking for a problem" approach to justify a project when the the problem was never defined in the first place. I never said this was the only solution nor did I say that this was the solution. I merely pointed out that someone has came up with a solution, one that solves the problems that 277 has endured, and one that places some extra "icing on the cake" if you will, which admirably is not needed, but it adds other elements, such as park space, land for development, etc etc etc. Certainly I can think of several other solutions on the top of my head, including demoing 277, seperate pedestrian bridges, to widening College or Tryon to accommodate separate bike lanes and pedestrian lanes. There are many other options out there also. There are always more than one way to solve a problem. In this case, someone with high aspirations have done a quick design, drawings, and if I recall hearing from someone else in person, even a fly through computer animation at the presentation. I said this earlier on, I don't even believe this design will bite, not in the next 10 years at least, let alone by 2010. I am typically the optimist, and after 300 S. Tryon bit the dust, I lost a lot of optimism since this project is about 10 times more unlikely to occur than 300 S Tryon (which was a very prominant project, already completed with land aquisition, land testing and stabilizing of Latta, advertising, and hell- they had a multi-million dollar piece of property with a Tryon address and a large profile park in the back). Also not saying that 300 will reemerge either, but back on topic. The cap project is a beginning step to get people talking, if anything, and also gives something visually for the general public to ponder upon. If this can be the thing that puts an end to this historical reoccurance that you had mentioned, Monsoon, as far as the project poking its head every 2 years, then this would be a breakthrough. Maybe over the next few years as a coorolation amongst all parties, the perfect plan can be implemented. Maybe it's a cap such as those presented, maybe it's something completely different. Point is that there is a problem and there is a solution. Sooner or later its bound to happen that we see something represeted in the form of a solution. Any reason we can endulge in what has been presented so far? I think there are great concepts and "large" thinkers here. We do have a hefty corporate representation in this city, lots of money... I don't think anything is impossible in this city, nor do I feel like I should demote the ideas that have appeared this week. ..... I think there are great concepts and "large" thinkers here. We do have a hefty corporate representation in this city, lots of money... I don't think anything is impossible in this city, nor do I feel like I should demote the ideas that have appeared this week. The real "large thinkers" would be figuring out how to deal with the multitude of the much more serious issues facing Charlotte and not designing freeway caps that primarily serve the purpose to make land more valuable for a few people. Tomorrow for example the air quality index is predicted to reach 109, and this is a consistent problem getting worse year after year, yet there is nothing more than lip service being given to the issue (and it's a lot more than cars). There are close to 8000 foreclosures taking place in this county and nobody is doing anything about what caused them in the first place. The list goes on and on. Yet we are being led to believe that $300M is something that should be considered for this project. This renderings above are just a re-hash of an old idea that has already been around for a decade. Dubone posted the earlier renderings from that exercise. It's not large thinking. Its not out of the box thinking. Its a failure to provide progressive thinking to the real issues facing Charlotte. There are many issues all around Charlotte, all over the country, and all over the world! What does this freeway cap have to do with all of these problems though? This is a completely separate factor that is being analyzed. If you want to play these games, then we should analyze why the NASCAR HofF is being built which has no purpose to air quality or improving these "city problems" that you so desirably speak of since it just going to be a tourist destination. What about those homes built on Lake Norman or Ballantyne? You want to solve these air quality problems.... then maybe we should demo them since those are the citizens that are contributing to the poor air quality by driving their SUV's and vehicles 20 miles to uptown every work day. Certainly there are many problems that need to be dealt with, but I don't see the significants of bringing air quality problems and trying to justify it by coorilating to what you consider to be issues of less sevarity. It's going to start with improving the little things in the city as a whole and repair problems that exist to start problem solving the macro-scale problems that you speak of. Edit: I also didn't say anything about property values. Since you did bring it up, however, everything is correlated... Higher land values could essentially have a turn on more money to the city (or is it the state that owns the right of way on this). Either way, taking money that is currently in developers hands could provide much needed money to help fix some of these macro-problems. The way you talk about air pollution makes me believe that you want the whole city to stop in its shoes and have everything dedicated to reducing air pollution, which is not just impractical, its stupid. Stupid because you are putting other things at risk and opening a door for a new macro-scale problem to evolve. And there are many people dedicated to working on the worlds air quality problems, since it's not just a Charlotte problem. In this case we have a group working on a solving method that is a problem enough that the City of Charlotte seems to think it is, as well as others here on UP. I'm a huge fan of mass transit and finding new technologies to reduce air pollution, but I find it extremely unfair to single out this one topic, when there are many others out there, and discredit it because it doesn't solve a problem that it's not meant to. I was offering up my opinion of your characterization of this project representing "large", "out of the box" thinking for Charlotte and thus is worthy of a serious discussion. Put in the context of Charlotte, I guess that you have a point on the thinking part. Is it progressive and what we needs to happen? No. I was offering up my opinion of your description this project represents "large", "out of the box" thinking for Charlotte and thus is worthy of a serious discussion. Fair enough. Pertaining to "out of box thinking"... The point is that maybe they aren't adequate thinkers to you because they aren't finding the answer to a problem that the whole world is coping with, but they did express and invent a specific interpretation for this specific area. It's that whole "don't reinvent the wheel" concept. It's the same thing- they aren't reinventing a cap- they have expressed a design that works for the area, or maybe it doesn't work- that is what is up for discussion and opinion so that it can be improved and changed. Either way it's a concept that can now be built upon. You sound like you have the answer then? If so, I'd be curious to your answer, as long as it's realistic, and I'm sure the city would be equally as interested. I respect your opinion, but I do think there is more than one solution, it's just lining it up to find what is best for the city and its citizens. Now you are being unfair. Nobody said anything about the entire world. I gave you a couple of examples of the real problems facing this city and you simply dismiss them with a statement such as this to somehow add some legitimacy to this project. It's the kind of response that one gets when one questions the fallacies behind the justifications for these kinds of proposals. Progressive, forward thinking cities, ARE dealing with pollution, development and other issues. If Charlotte really wanted to make a statement on this matter, they instead would be making proposals to decrease freeway traffic in the center city. They aren't of course because that would actually require some sacrifice. Is it gonna happen? No. And it won't happen because as this example shows, we can't even have a serious discussion on the matter. To that end, I'm all for ripping up 277 on the south side, allowing Independence to still connect to 77 on the North, and adding that land back to the tax rolls. Re-enable the grid and link South End and Elizabeth to downtown again. I'm for the opposite of that. Cap it on the south side, and rip it up on the northern side. Belmont and Optimist Park are in more dire need of connectivity with uptown than Southend. Plus, I'd like to see a continuous greenway for Sugar Creek. I guess I have a compromise solution: rip the entire thing out. I honestly can't stand 277. You look at those aerials of Charlotte and Vienna and they're like night and day. ^^^^ You mean the same way MANY cities got rid of their streetcars when it was considered "cool" and "progressive" to have buses instead. I agree, I-277 is a bother (and eyesore) at times when it comes to getting into Uptown, but imagine uptown without it. Think about the thousands of workers, sports goers, and concert goers. Without direct freeway access, Uptown would struggle to move large amounts of people in and out. This could actually hurt uptown in the long run. If a city like Boston saw the need to keep its downtown freeway and spend BILLIONS burying it, Charlotte can certainly cap the southside of I-277 for only millions. One of Charlotte's biggest mistakes (and often repeated mistake) is getting rid of infrastructure that already exists. I say cap the freeway and keep it. We'll be sorry if we destroy any section of it. Um, I-77 would still provide freeway access into Uptown. And somehow, I-85 carries a bit of traffic, despite its lack of access into Uptown. ^^^This is true, but think about the smaller streets leading to I-77. Think about the traffic during the rush hour and special events. I am ALL for urban planning and pedestrian friendly design, but I wouldn't support removing any existing infrastructure. Like I've said, getting rid of infrastructure already in place is a silly mistake Charlotte has made in the past. Everyone thought it was so smart to get rid of Charlotte's old streetcar network. Today, we would "kill" for a streetcar to Dilworth and Elizabeth. I think a cap over the southside of the freeway would be perfect. It would fix an urban mistake and it saves a MUCH needed transportation asset for uptown. Besides, real cities (NYC, Tokyo, Osaka) could easily fit 100,000 people inside I-277. When Charlotte gets to that point, I am all for removing I-277. As for now, 7 times more people work in Uptown as opposed to living in Uptown. Which means the vast majority of Uptown workers and visitors drive in. Knowing this, how much urban sense does destroying I-277 (the one road that carries the majority of this crowd) make? This is why Boston performed the "Big Dig". They knew how important it was to keep their central freeway. If urban Boston saw a need for such a freeway, why on Earth would Charlotte remove such a freeway? Especially when Charlotte can "fix" I-277 at a fraction of what the "Big Dig" cost. Dude, a true grid design makes moving traffic very easy. Downtown is one of the only places that we actually have a grid. There are enough exits off of 77 (5th street tryon, etc) that ripping up 277 would not hurt connectivity. It's just as easy to get out on gameday by going down South first and then hooking up with 77 later anyway. The addition of streetcars and the northern light rail line would make moving people in and out of downtown even easier. Erase 277, I'm all for it. Yeah, I see your point. There is still a lot that can be done to improve it, including removing all the loops, from Graham St. all the way around, and redesigning the 277/Independence spaghetti FUBAR to have a much smaller footprint and provide for an uninterrupted Sugar Creek greenway. Also, I'd like to see all bridges over 277 have a pedestrian/bicycle lane that is separated from car lanes. I guess I am in the minority here, but I think it is silly to remove a freeway that MANY truckers (like myself) use to make deliveries into uptown. Again, I am all for urban planning, but putting more people into uptown (and taking away freeway access that freight delivery drivers need to bring these uptown dwellers their goodies) is just plain stupid. I hate to be blunt, but it is what it is. Freight doesn't come into uptown by streetcar and light rail. More people=more freight. Cap the freeway and be done with it. Even NYC has an extensive expressway and parkway system (big trucks are not allowed on the Parkways. I learned that the lesson the hard way). I get so sick and tired of the so called "urban planners" making "boneheaded" decisions that end up costing everyone. I bet none of you ever thought about what taking a freeway away from Uptown would do to the cost of hauling freight into uptown. If the cost of hauling freight into an area becomes too costly, development will go some place else. This is a fact. Thousands of trucks (big, loud, nasty, anti-urban, pollution spewing trucks YUCK!!!) use I-277 a day. OK. Let's just tear up I-277 and put all these bad boys on the city's grid. Yeah!!! That's the "urban" thing to do. It'll be GREAT!!! Nothing like that big truck (that used to have the John Belk) making his way down Stonewall instead to deliver at Midtown. Good idea guys. I like the idea of giving the intersections a smaller footprint. There should not be ANY cloverleafs on I-277. I also LOVE the idea of a freeway CAP. To me, this is the perfect solution. 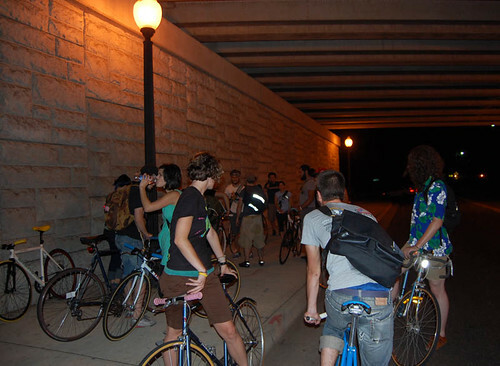 In addition to removing cloverleafs and making bridges over 277 pedestrian and bicycle friendly, I'd like to see the underpasses made more pedestrian and bicycle friendly (and safer). This would include wide sidewalks, and having the area where the columns are located "walled off" to prevent people from hiding or loitering there, and adding lots of lights. ^^^Awesome pic man!!! I do use your pics quite often when I am "showing off" Charlotte. I give you full credit everytime and I hope you don't mind. Back to the topic, I was thinking of the Plaza Midwood area when I posted about changing the intersections. I used to attend a Catholic School near that pic (Our Lady of the Assumption). The school has since relocated to Shamrock Drive because of the construction that took place awhile back on Independence. Speaking of which, Independence (the new freeway styled Independence) was designed worse than I-277. I remember when Independence and the Morningside area was actually a neighborhood. My mom (R.I.P. ma) and I used to eat at the KFC on the corner of Independence and The Plaza. I think there was a Krispy Kreme there too if I remember correctly. Anyways, I-277 is heavily used by us freight haulers. Places like Presby, CMC, and the Elizabeth area all get a decent amount of local big truck deliveries. Big trucks even deliver into places like Hearst Tower and the Harris Teeter at 5th and Poplar. Getting rid of I-277 would not affect the western side of central Charlotte, but it would hurt the eastern side BIG TIME. I don't want any part of central Charlotte to suffer in the name of "urban progress". One aspect of 277 that we all have to recognize is that there is a large volume of cross-town traffic that uses it to get from Independence to 77. We could potentiall remove Belk or Brookshire, but one of them has to stay to funnel all the traffic to the interstate. I'd rather see Brookshire go away since Belk can be bridged (potentially). What they should do is pull a big dig like in Boston. If we can talk Ted Kennedy into giving us money then anything is possible. Sure, that was only $2.3B (yes "B") per mile! Somehow Raleigh manages to have a growing downtown without any direct freeway access. San Francisco, Portland, and Milwaukee are well-known for successfully removing freeways. Seattle and Louisville citizens are unfortunately losing the battle against their State DOT's. Within the Southeast, Chattanooga successfully dieted a downtown segment of an expressway along their revitalized riverfront, keeping much of the original infrastructure, restriping for fewer lanes and angled parking. San Francisco, Portland, and Milwaukee are well-known for successfully removing freeways.